I’m giving myself credit today. Something I don’t often do. To really take it all in. What it means to have accomplished all that I’ve done. What it really means. It doesn’t feel that way when you’re in it. When you’ve fought it. And screamed it. And it’s not always easy to give credit when you don’t feel like you did it as well as others could. So I’m letting go of the over thinking, and simply reminding myself, I defied the odds. Part of the power in embracing the moment, is the inherent necessity to fully embrace all parts of ourselves, the wholeness, to move forward with strength and vulnerability, a delicate balance that allows for honest truth and powerful choice. I started out, as most might, denying all the perceived negative attributes of my upbringing. I cannot let people know about my life, besides, I’m never going to be like that again, never going to allow that to happen, so why shouldn’t it be a secret? While there is a distinct difference between publicly shaming ourselves or our loved ones and telling our stories with integrity and truth, there is power to integrating and allowing the skills we developed, as a result of the challenges we’ve faced, into our normal day to day lives. Integrating this life experience adds tremendous strength, deepens the purpose and meaning to our lives, and frees us from the shame. Turning these survival mechanisms into life skills makes us better at living. And allowing ourselves to give ourselves credit for defying the odds, well, that sure does make us feel good…and grateful. I was the first in my family to graduate from college, UCLA with a bachelor’s in Chemistry. I married a good man, a wonderful father to our son. I respect money and all that it offers and doesn’t offer us. I value relationships beyond just how they serve my best interest. I live free of dependency on alcohol and drugs. I stay home, despite the risks and sacrifices, to care for my family. According the the odds, and my life story, I shouldn’t be where I am, wouldn’t have made any of these choices. Some of it may have been luck, but most of it is good decision making, and today, I am giving myself credit. Tomorrow, well, it will be all the people that supported and loved me along the way, but for today, I am going to let it be me. 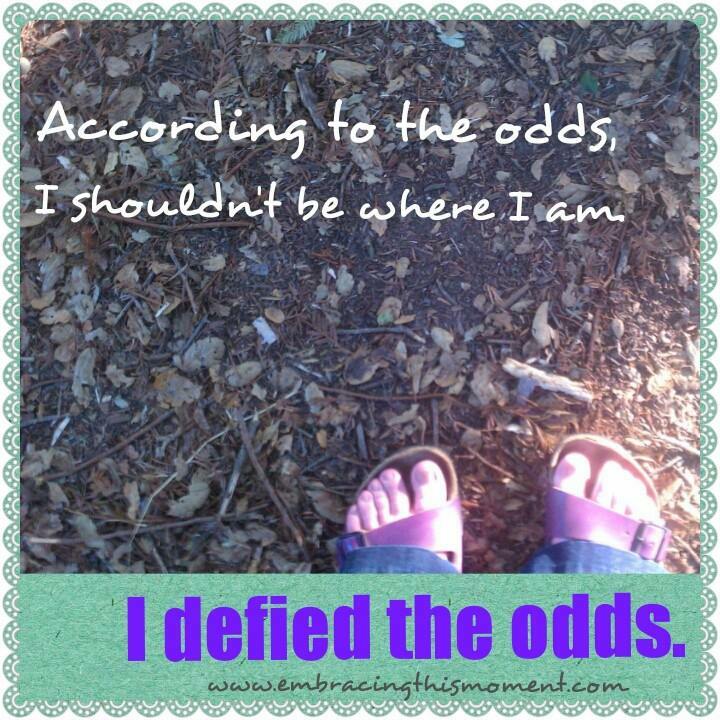 I defy the odds by being open to change and being willing to embrace every moment. How have you defied the odds? Are you giving yourself the much needed credit? 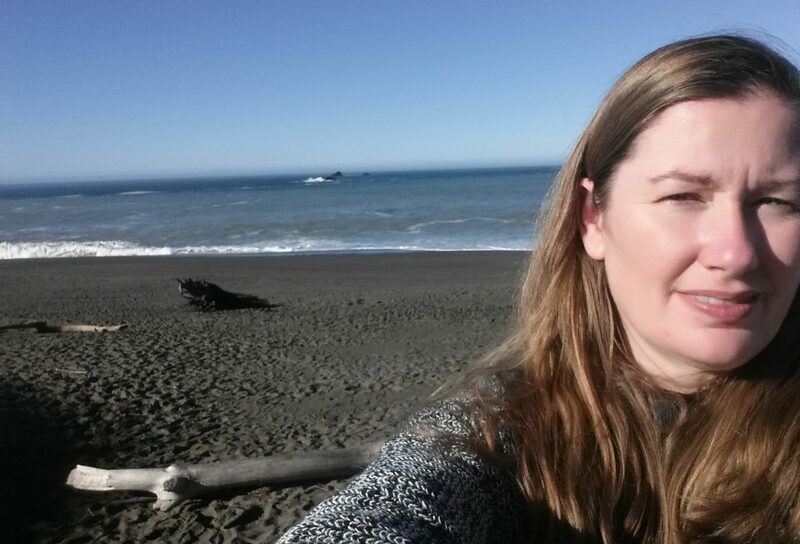 If you’re curious about what I’ve overcome, you might be interested in reading a bit of my life stories, shared on my first blog, http://www.embracingthismoment.blogspot.com. Do I Save It, Just in Case? Another beautiful post, Aubrey! I tip my hat to you in honor of your self acceptance, awareness and praise. You’re right, we give ourselves credit far too infrequently and we often self impose limits because the odds tells us to. Kudos to stepping outside of that toxic loop. Way to go for day 2 #31dbc. Also, thanks so much for the Byron Katie recommendation. I hadn’t heard of her but my fiance and mom had. I found the YouTube video about The Work incredibly helpful. I’ve been doing something similar but not as clearly defined. I really love the step by step process! THANKS did sharing! Kieta, we made it to day two! I’m so, so happy you found Byron Katie’s links helpful! There is a solid grounding to her method that allows you to get to the truth fairly quickly. Yay. I love that you defy the odds by embracing your body! I often try to remember and reaffirm that my body is always working in my favor, that it’s my mind that fails me. But, it is my biggest challenge right now. I often live in my head and not so much in my body, if that makes any sense? My family is FAR from perfect. Unfortunately, one relative, decided to publish for all the world to read, just how imperfect we really were. I was very active in the community and I was embarrassed that for a while I had actually gone into voluntary seclusion. I thought that everyone would judge me based on the things that were revealed in that book. I am still learning to find strength in that experience but I think I defied the odds by putting myself out there for all of the world to see and critique, via my blog. So far it has been all positive. BTW, Thanks for the comment on my post. That was a deep post, Aubrey. Wow. Kudos to you for overcoming so much in your life! Feels great to come out on top, doesn’t it? Be proud! I thought I commented here! That darn iPhone! This is a great post and a great guide that I can use in my life! Thank you, Aubrey! Angel, I do the same thing on my phone all the time! Thanks for the support! Next PostNext Where Does Feeling Unwanted Get Me?